ABSTRACT: Protests against naphtha crackers have been an important trend in Taiwan’s environmentalism since their emergence in the mid-1980s. This article analyses ten protest cases (1987-2011) to understand the evolution of environmental politics. I draw the following conclusions: (1) with the growing public awareness of pollution, new petrochemical projects are increasingly facing popular opposition; (2) the environmental movement assumes less partisanship, although ideological differences between the political parties still remains; (3) the mobilising capacity of NGOs is on the rise and has become the key factor in the success of protests. KEYWORDS: environmentalism, Petrochemical Industry, Naphtha Crackers, Environmental Impact Assessment, Taiwan. ABSTRACT: This article focuses on the growth and transformation of the movement against the expansion of science parks and electronics hazards in Taiwan. The author finds that the movement has brought about a strong overall trend against the industry’s expansion and has gradually raised significant concern for environmental justice in the past decade. Concern for environmental and social justice has been interwoven to frame the movement’s discourse and actions in the following three aspects: first, campaigning for procedural justice, democratic decision-making, and information transparency; second, campaigning for distributive justice of land, water, and environmental risk; and third, campaigning for the right of recognition. ABSTRACT:How should the considerable discrepancy between the concepts of sustainable urban development proclaimed by the Chinese authorities and the reality on the ground be understood? This article examines the urban planning procedures that currently hold sway in China. The building of new cities is based upon a generic method of hyper-productivist and functionalist planning, reflected as a pyramid structure that extends over the whole country and is embodied by urban zoning on a vast scale. This procedure, which has been in force for nearly 30 years, is not at present one that is called into question by Chinese decision-makers, and does not take environmental principles seriously into account. Conversely, all of the reasoning upon which urban development is based remains very far removed from environmental considerations. China is continuing down the road of accelerated development behind the wheel of a growing hyper-functionalist urban machine. KEYWORDS: urban planning, environment, sustainable development, urban planning model, functionalist urban planning, utilities networks, institutional system, SIP (Suzhou Industrial Park). ABSTRACT: China has witnessed several peaceful and successful anti-PX (para-xylene) protests in Xiamen, Dalian, and Ningbo in recent years. However, the protest in Maoming in 2014 turned out to be a noteworthy exception. 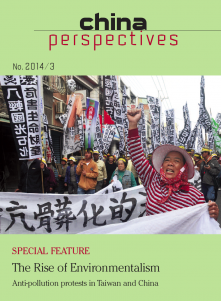 By using participant observation and in-depth interview data, this article raises the following observations: first, in spite of official propaganda, Maoming citizens actually understand the environmental risk of PX production because of their personal experiences with existing pollution as well as from their knowledge of the Xiamen incident. Secondly, the Maoming protest proceeded in a less organised manner, which explains its violent tendencies. Finally, the large-scale protest was able to proceed without the support of mainstream media and the middle class due to the use of online social media and local knowledge of the urban terrain.